SENTENCED TO STENCH FOR LIFE! Varna system is extensively discussed in Dharma-sastras. 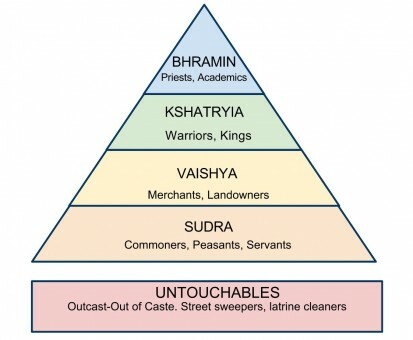 The Varna system in Dharma-sastras divides society into four varnas (Brahmins, Kshatriyas, Vaishya and Shudras). Those who fall out of this system because of their grievous sins are ostracised as outcastes (untouchables) and considered outside the varna system. Barbarians and those who are unrighteous or unethical are also considered outcastes. If you think that your job is odious or disgusting, have a look at the following pictures. What do you see on his face? …And what do you think of the job of this unfortunate man? What crime has this man committed to be forced to do this dirty work? They must enter this hole to feed themselves and their children, day after day! Believe it or not, the fact is that this odious work is going on around us, day in and day out. In return for what they do, they receive a pittance. Their job is not just filthy, it is hazardous. They contract infections, disease and some even die while performing their thankless job. And we take no note of it. 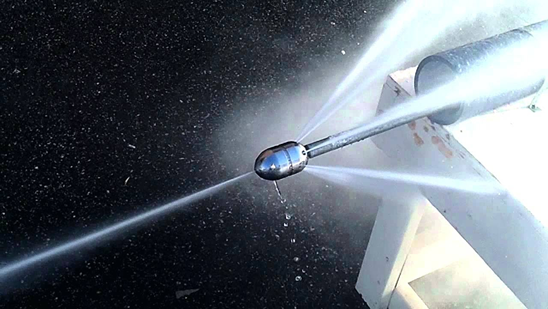 Ever so often, the poisonous gases in the sewer result in fatalities. I read a paper in which the research worker estimated that the total number of sewer scavengers killed annually is almost equal to the soldiers who are martyred each year! Why do the Sewers get choked? We, the peoples of India, are the root cause of the problem! I have a gut feeling that many other mechanical systems have been devised to save our men from the torture of entering the gruesome pipes. Yet, every now and then, I find a news item, informing me about the death of an unfortunate scavenger. I am quite certain that in civilized countries, men are not required to enter sewer pipes. The fate of ‘Laws’ in our beloved country. The machines required for the purpose have not been provided. And even if they are there, the workers do not know how to operate them. Men are willing to do this dirty work at a very low cost. These wretched men have inherited this skill from their ancestors…and they have been taught to believe that it is their ‘dharma’ to perform this function. Last, but not the least, the scavengers have no other skill. If they do not unclog sewers, they will starve to death for want of gainful employment! Until we are able to completely mechanise the sewer maintenance process, protective gear of the kind shown below must be provided as a mandate. 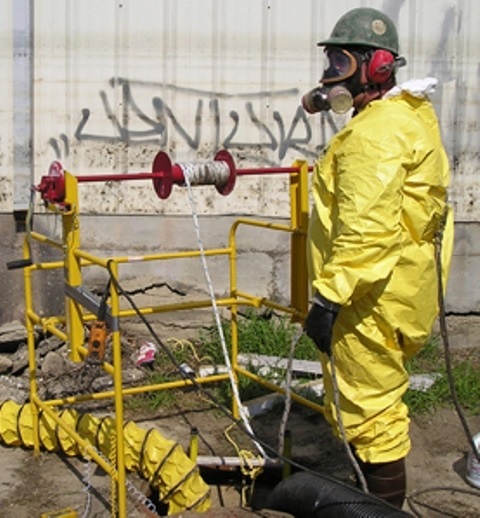 And this should include a pipe through which the worker can inhale clean air, to protect him from harm. If we cannot take the man out of the manhole, let us protect him, and let him breathe clean air! Sewers get blocked because of a few well known reasons. 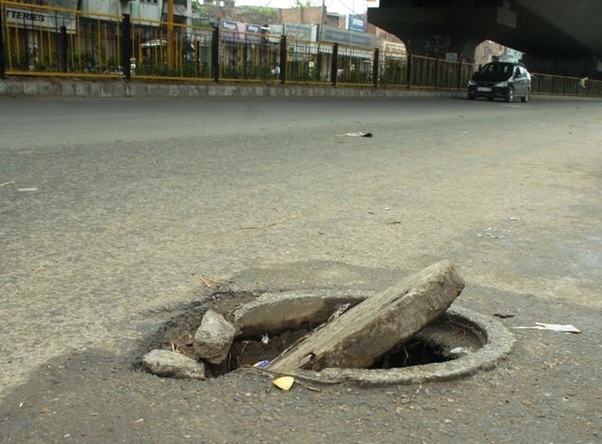 These are: tree roots growing into the pipes; sewer lines caving inwards due to poor design; industrial effluents released into drains, and domestic garbage thrown into broken or stolen manhole covers. Nearly all these faults can be remedied if timely remedial action is taken by the concerned authorities. People who violate the sewer norms deserve to chastised, and the punishment should be so severe that it acts as a deterrent. An outlandish solution that occurs to me is that those who damage sewers should be forced to clean them. This would also be in line with our traditional ‘Varna’ system. In the management schools, they teach us to identify ‘win-win’ solutions. In the present case we are faced with a situation, which leads us to its diametrically opposite aspect. Our worthy representatives in the legislatures need to address all facets of the problem. Just as accidents and divorces cannot be stopped by making them illegal, the men shown in the pictures above cannot be relieved of their misery by an act of parliament or legislative assembly. However, it is possible to begin the reform process by creating public opinion. And that is the precise purpose of this paper. Sewer cleaning services sewage in bangalore near me madipakkam. The rearward jet propels the mouse forward and makes it rotate. The mouse and its shaft are inside a flexible casing. Please google sewer cleaning machine + Bangalore. Saw the TV clip. Totally agree that this inhuman practice needs to be stopped and a mechanical solution be devised to replace it. Our engineers need to find a solution and I shall certainly spread the word around. - provision of protective gear such as gas masks, boots, gloves etc. - instrument to check presence of poisonous gas. - equipment for speedy evacuation of workers. Like Joseph’s remarks, even in my land of abode (Kyrgyzstan – not among the developed countries), city authorities organize cleaning through special purpose vehicles. Even domestic septic tanks, where necessary, are cleaned up accordingly. CHALTA HAI & lack of sensitivity is the mindset in India. Endless prayers for your efforts & creating awareness. I think there is an urgent need to educate our people and to tell them how to use the sewer lines. Most of the blockages are preventable. The poem at the end is most appropriate. jhooth ki koi inteha hi nahin! It tells a profound truth. 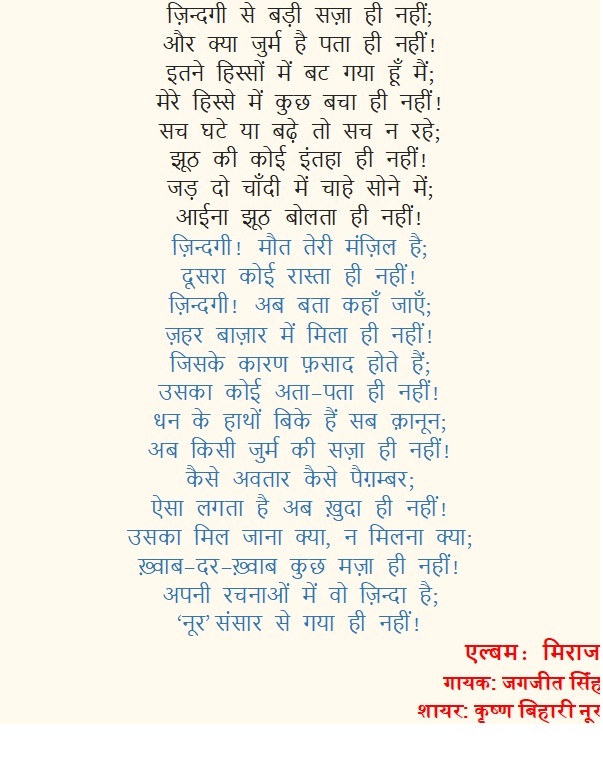 This otherwise unknown poet has become note-worthy by Jagjit singing it! No one had heard of “Noor” I believe he was a postal clerk, who wrote poems as a hobby. Now the last stanza has come true. KB Noor died a few years ago. But this poem has made him immortal! The thankless job of these menial workers is as important as that of fire fighters and doctors working in trauma centres. Life comes to a stand-still if a sewer line is choked. One can not breathe, until these men arrive. Yet I have never seen any one saying a kind word to them. In fact if one of them comes and seeks a glass of water, people give it in the worst glass in the house. In fact I once saw a house-wife asking the poor man to drink it out his cusped hand! And the same woman brings out the choicest crockery when a rich guest (who may be a black marketer or smuggler) comes to their house! And if a person from these communities enters the kitchen, women used to wash and sanitize the entire place…for reasons of hygiene. I was reminded of a movie filmed on Coal Mines. I think it had Amitabh Bachchan in the lead role. It was a moving theme. It is my fond hope that some one will act—and act fast! The title of the film was ‘Kaala Pathhar’ I have a very vivid memory of the theme. I wish some one would make a movie on this theme! The plight of construction workers and men involved on building mountain roads needs to be studied and reported in the same way. Their lives involves a lot of risk and their conditions of living are pathetic. The NDTV programme should be made compulsory viewing by all our parliamentarians! 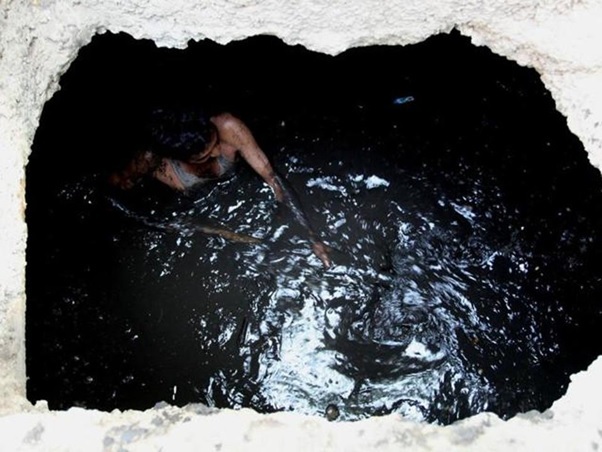 All the unfortunate sewer cleaners belong to a low caste…and they cannot tell the story themselves; being illiterate. And so we are not able to get a first hand account of their misery. ‘God’ is there…and that is why things do happen. Count your blessings…Telephones were a luxury until a few decades ago. Today the poorest of the poor has a ‘mobile’ in his hand. Electric power situation has improved…and it is becoming better every day. It is my firm belief that we will be able to ‘take man out of the manhole’ very soon. Fully endorse your thought provoking initiative. We are talking so much about Chandigarh being a Smart City. Let us also look around us and sort out ages old practices. Thanks for writing to Gen MS Kandal. I am told that the situation is far better in Chandigarh than elsewhere…including Delhi. But there is enough room for improvement! It is my fond hope that it will open the eyes of those who matter! No one holds barred. There is no bharat bhand for them & no job reservation. Quota is there for them because the vote bank is so small. Kahan hain woh log jinhe hind pe naz hai.? Thanks. You have reminded me of a very soul stirring song! Very well written blog . to reduce the misery of the down trodden . cater for the benefit of the rich and mighty . Rich are getting richer and poor more poor . We can help, by speaking up! We also have to vote sagaciously. There are people to get inside manholes even in US and Europe. But the difference is, they wear proper personal protection equipment. And they are qualified too. In India, everything works based on Jugaad, including the governments, defence and Other organisations. I don’t know when was the last time our forces went into the battle with the right weapons, dresses and other equipment. It is only their high spirits and commitment to the country that is helping them to defeat the Pakistani bastards every time. India missed the Industrial Revolution, because the ‘Raj’ did not let technology enter into our holy land. We have to catch up, and we are doing so. Only, there is a need to quicken the pace, and have the right priorities. 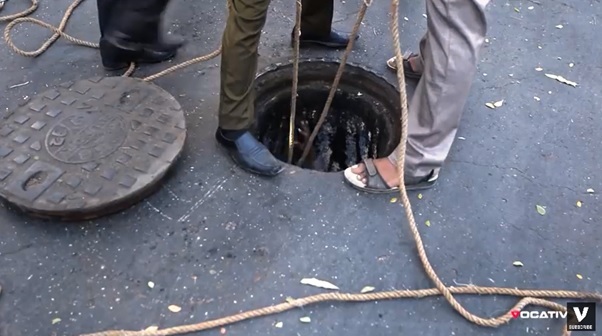 A similar tragedy occurred near Hitec City ,Hyderabad a few months back where a couple of sewage cleaners were sucked in and lost their lives. It is high time that the government bring a legislation to ban this manual scavenging. You have said a lot in the last line! We treat them as ‘untouchable’ because we have ‘dirty minds’ ! There have been many deaths in 2017 of workers cleaning gutters and sewage drains.In Feb 2018 Delhi Jal Board has purchased sewage cleaning machine. Humans cleaning sewage drains is barred by law. there has been a movement in all cities in the right directions. Hopefully all these guys will get their life back in perspective. In some places, the machines have already taken over. In Chandigarh, for instance, we have never seen men having to do the dirty work. A truck appears, and soon the sewer line is opened. However, in Panchkula which is so near us, the Sector 20 blockage took almost a week to be restored. It was only when the press blew it up, that the authorities got into action. Nothing happens in this country till it is blown up by the media. Municipal Corporations are there for show. No drains are maintained . No mosquito protection is done. Collection of Property Tax is paramount. Our NDMC( looking after Lutyens Zone) has no problems because they work. 24*7 electricity, water, well maintained Parks, Clean roads and no sewage blockade ever. Wish all will follow their work ethics. It is high time that this cruel and degrading practice is stopped. But for an accident of birth, any one of us could have been forced to do such work. Since all these wretches come from an unfortunate class, we do not identify ourselves with them. And that is why things are not moving fast enough!